One of the key aspects that should guide you during selection of a school is accreditation status. Accredited schools or programs are those that have undergone thorough evaluation and been found to meet minimum requirements or accreditation standards. This is an assurance to the public of the high quality of education offered and provides reasonable assurance of continued high standards in the future. Within the US, accreditation of respiratory care programs is undertaken by the Commission on Accreditation for Respiratory Care (CoARC). The commission provides an online directory that allows you to confirm if a program is accredited. Institutional accreditation refers to the status that a school is awarded, after going through the review process. This type of accreditation may be awarded by regional or national accrediting agencies. Individual programs within an institution may also seek professional or programmatic accreditation from specific agencies in the field. In order to practice, individuals must take an examination administered by the National Board for Respiratory Care (NBRC). Those who pass the exam are awarded a license to practice in the field. However, program accreditation by the CoARC is one of the NBRC eligibility requirements. Academic Advancement – if you plan on pursuing an advanced degree, it is vital that you earn your associate or bachelor’s degree from an accredited institution. Many schools do not accept prior degrees earned from unaccredited institutions. Educational Improvement – higher educational institutions utilize accreditation to continuously evaluate and enhance the quality of their programs. Employers – accreditation makes it easier for employers to recruit job candidates who have undergone thorough training and are well prepared for the field. Financial Aid – for an institution to receive federal funding, it should have been awarded accredited status. Enrolling in an accredited school makes you eligible for federal funding, which facilitates attainment of academic goals. Licensing and Registration – in most cases, accreditation is a requirement for application for licensing or registration. Many certification boards also use accreditation to screen applicants. Transfer of Credits – accreditation provides a mechanism for transferring credits from one institution to another. This facilitates academic progression of students. Diploma mills are entities that award certificates, diplomas or degrees to individuals without requiring completion of comprehensive coursework. Such entities are usually not accredited or may be accredited by fake accrediting agencies. The main objective of diploma mills is to obtain money from individuals while offering a substandard education. Earning your diploma or degree from a diploma mill is bound to hamper your academic and professional progression. Accredited institutions and employers as well as licensing, regulatory and certification bodies do not recognize diplomas from diploma mills. Spending your money on an education that doesn’t meet established standards and earning a worthless credential isn’t an experience you want to go through. Here are some guidelines to help you recognize diploma mills. Accreditation – when an institution provides no evidence regarding accreditation status, this is usually a telling sign. In some cases, the institution may have been awarded accreditation from a questionable body, not recognized by the US Department of Education. Some entities try and impress individuals with several accrediting agencies. College Credits – in cases where there is too much focus on offering college credits for real world experience, be wary. 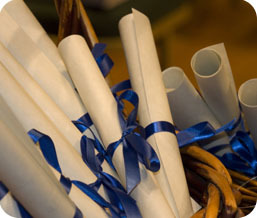 Commercialization – many diploma mills offer diplomas or degrees for sale. Other institutions charge tuition on the basis of each degree or offer discounts to students who enroll for several degree programs. Licensure – the absence of state or federal licensure to operate is often an indication of a diploma mill. Program Duration – think twice about schools that offer degrees that can be earned in a very short time compared to what accredited postsecondary institutions offer.